Guy Gibsons' first Lancaster operation was on 8th July 1942 when he took ten aircraft and bombed the docks at Wilhemshaven. Gibson named his aircraft Admiral Prune and the aircraft's side was decorated with a Mickey Mouse figure with bombs underneath, depicting the number of trips or operations the aircraft had carried out. This aircraft was often used by Wg. Cdr. Guy Gibson, the squadron CO during his time with 106 squadron. 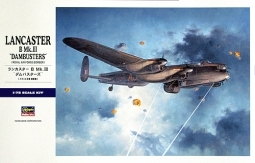 Gibson went on to win the VC the following year as leader of the famous 'Dambusters' raid. 'Admiral Prune' flew 640 hrs before being lost on the Turin raid of 4/5 February 1943. 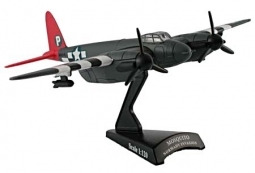 Scale 1/144, Length 5.75", Width 8.5"
Avro Lancaster B Mk.3 "Dambusters"